Decorete a room with your initial, as easy as 1,2, & 3! Wire Hanger Scrap Fabric s Or Old Clothes Strong Glue Misc. Decorations Such As Ribbons, Feathers, Etc. Button(s) , Ribbons, Feathers..
1- Use a wire hanger to make the letter. I found that using pliers made it more easy and detailed. 2- Wrap some batting strips all over the wire, using hot glue to secure it at the begining and end of each strip. 3- Cover the letter with fabric strips according to the color scheme of your preference. Since the "S" I made stands for "Sofia", my baby, I kept it on the girly pastel color scheme. Use hot glue where necessary. 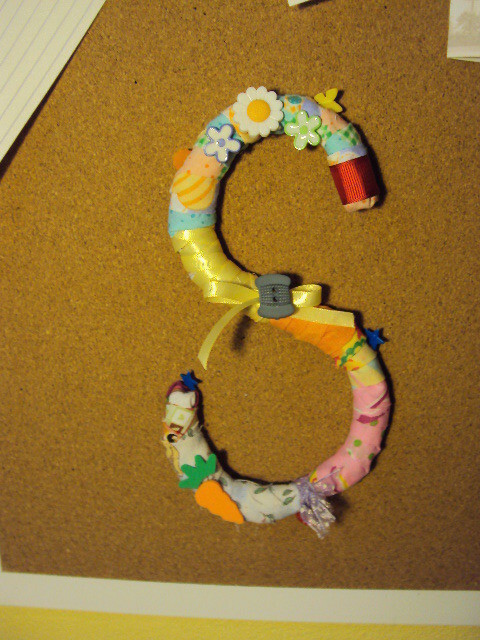 4- Add ribbon, buttons, flowers or anything you like on the letter. Another inspiration for my collection of N's! !